Copper Lakes is a +1,300 home master planned community located in northwest Harris County, Houston Texas. Surround by Highway 290, Highway 6 and the recently completed Highway 99 (The Grand Parkway), Copper Lakes is a beautiful neighborhood strategically located for easy commutes to work, school or play. Copper Lakes homes for sale in 2015 reported sales in the $160,000 to $550,000 range. Values have steadily increased as the Copper Lakes recently was completed. New construction builders in Copper Lakes included Highland Homes, Trendmaker Homes, Partners in Building, Taylor Morrison and others. Copper Lakes also features a custom gated section with larger homes. Most of the homes in Copper Lakes average four bedroom, range form 2,500 to 3,500 square feet and were built in the mid 1990s to 2015. Amenities buyers will preview in Copper Lakes homes for sale include Langham Creek YMCA, local churches such as West Houston Church of Christ, high ranked Cypress-Fairbanks schools including Copeland Elementary School and Aragon Middle School , miles of trails around the local water ways, 2 community pools and several parks. In addition, shopping such as the Houston Premium Outlet Mall and many dining options within a 5 mile radius of Copper Lakes. Just outside Copper Lakes homes for sale is the recently completed Harris County Deputy Darren Goforth Park. The large 400 acre public park includes a lake, 2.5 miles of trails, dog parks and more. The Lone Star Community college, Cy-Fair branch is within walking distance of Copper Lakes. Towne Lake, west of Copper Lakes, features an entertainment and dining destination called Boardwalk along Towne Lake’s waterways. Don’t forget the Houston Energy Corridor, a hub of Houston employment, is located 20 minutes to the south of Copper Lakes making for an easy commute to work. A well planned area, Copper Lakes offers the high quality homes, manicured lawns and monument entrances that will impress you and your guest as well as a price range for everyone’s budget. To schedule a tour of Copper Lakes homes for sale or to receive price information on your home, please contact Mark McNitt at 832-567-4357. The gorgeous curb appeal of this home is inviting but the included special features and upgrades will surprise and delight you! Custom designed and remodeled in 2011 included expanding this home to over 7K sq.ft. Designer features include a man cave with custom arched doors, 35 case wine cellar, top of the line professional grade stainless steel appliances, 3 fireplaces and custom cabinets throughout! The two story family room opens up to the huge private lot with outdoor cabana/summer kitchen which backs to a greenbelt! The master wing offers a soothing retreat with its own sitting area, office and separate formal bedroom with dual fireplace. You 8217;ll love the designer spa bathtub, custom rain/jets shower, hidden TV mirror and his and hers closets. The upstairs features ample sized guest rooms, game room, gym, wrapping room, media room and garage apartment with elevator shaft. Car enthusiasts will love the long gated driveway which leads to a 6 car garage with reinforced lift ready bay! Designed with Distinction! 4 bedrooms, 3.5 bathrooms, spectacular front entry boasts a stunning curved wrought iron staircase with decorative carpet, high ceiling & crown molding. Study has wood flooring & French doors for privacy. Spacious formal dining room is adorned with crown molding & wood flooring. Open family room has soaring ceiling with wall of windows for a lovely backyard & lake view. The kitchen is a chef 8217;s dream with a huge island, granite countertops, 42 8221; cabinets, 5 burner gas cooktop & stainless-steel appliances. The sunroom off the kitchen is the perfect spot to relax with your morning coffee! The master suite with sitting area & exquisite custom designed Ethan Allen draperies is complete with a large bathroom featuring granite counters, his/her vanities, huge corner shower & separate whirlpool tub with gorgeous tilework. 3 well appointed bedrooms, gameroom, media room & 2 full bathrooms upstairs. Surround sound, 50-yr. shingle roof, water softener, sprinkler system. Stunning is an understatement for this home! A two story foyer greets you with a beautiful staircase and hand-scraped hardwood flooring throughout. The office is tucked behind french doors and adorned with wooden floor to ceiling bookshelves. Dramatic living room features a stone fireplace, 2-story ceilings flanked with wooden beams, plantation shutters lining all windows overlooking the back patio and outdoor fireplace, & an open concept floorplan that leads into the breathtaking kitchen. This home has one of the most beautiful kitchens you will ever see! Recently painted white cabinets, granite counters, stainless steel appliances, a butlers pantry with a built-in wine refrigerator, & huge breakfast nook make this the perfect space for entertaining friends & family. Massive master suite/bathroom & a secondary bedroom w ensuite bathroom are downstairs. Upstairs boasts game room (pool table negotiable! ), media room, homework station, 3 more bedrooms, & 2 more bathrooms. NEVER FLOODED! Located in the gated section called The Estates of Copper Lakes sits Mediterranean Charm on exceptionally 13; large cul-de-sac lot. Stunning formal dining and living rooms welcome you home guiding you to the open 13; concept family room. Exceptionally large kitchen is a chef's dream that boasts abundant counter space and 13; storage, stainless steel appliances, gas cooktop, and double ovens. Kitchen perfectly opens to the family room 13; making entertaining and daily living memorable for guests and families. Large and spacious master bedroom 13; with en suite bathroom boasts large closets with separate tub and shower. Additional 3 bedrooms and 2 full 13; bathrooms complete the downstairs living. Bonus private large room upstairs with incredible closet storage 13; and full bath can be a perfect 5th bedroom, teenager hang out, guest suite or media room. Massive lot big 13; enough for pool, playground, basketball court...the options are endless! This spacious two story features a sparkling pool, hot tub, & an excellent stone & brick curb appeal! Inside you'll find lovely tile throughout the first floor, high ceilings, & an open floor plan great for entertaining! There's a formal dining, French door study, wrought iron stair parts, a breakfast area, living room with a fireplace, & an upstairs game room. The open kitchen boasts granite counters, stainless steel appliances, recessed lighting, & a breakfast bar! This home features two large master suites, both with sitting areas, dual sinks, separate showers, & fantastic walk-in closets! Enjoy your backyard oasis complete with a covered patio & lush landscaping! Conveniently located near lots of recreation spots, retail, restaurants, the Berry Center, YMCA, Boardwalk at Towne Lake, & more! Easy access to major roadways including Highway 6, FM 529, & U.S. 290. 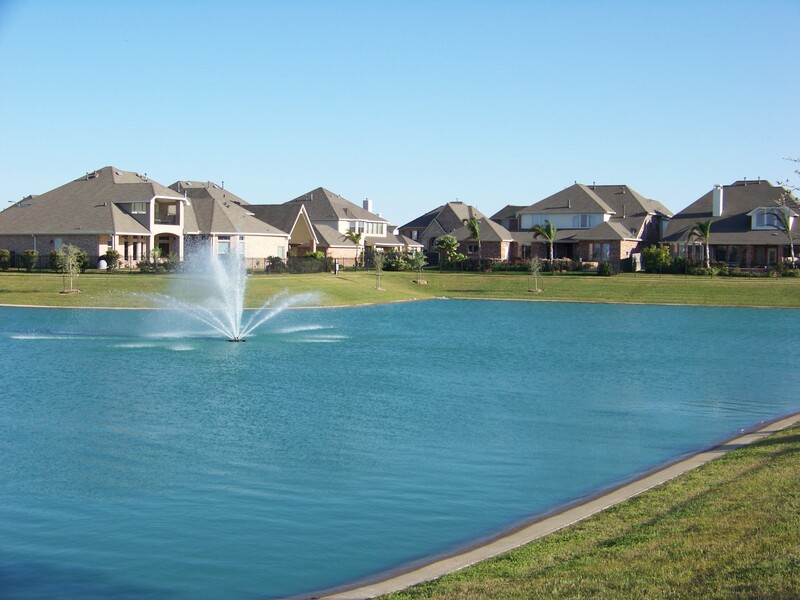 Copper Lakes subdivision offers a beautiful nature trail, lakes, pools, parks, & tennis courts!